Pg. 13 Useful Life Expectancy (ULE) 這概念看似合理, 但對各品種的基礎生理研究有足夠的理據去作出判斷嗎? 尚未在報告內找到有關參考資料. Pg. 15 Figure 2-1 Urban Heat Island (UHI) 夏季/冬季的比較, 亦似夏季的南風及冬季的北風加上大帽山阻隔的影響. Pg. 18 Community Concerns 真的只有負面觀感? 是為報告而寫還是調查結果? Pg. 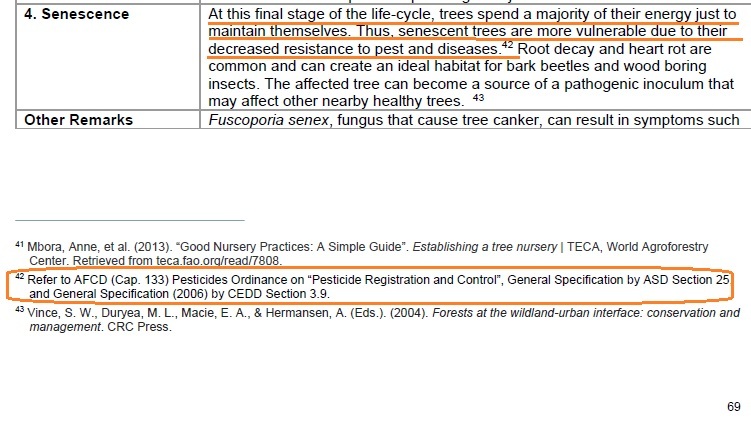 28 "The existing top 20 dominant roadside tree species are therefore not selected for further study and inclusion into the Guide." 那這二十種主要品種的ULE為何? 沒有相關資料, 如何妥善管理? 排除的原因難以理解. 亦未見提出有關資料所在. Pg. 32 Manageability / Crown Management - 內容未有包括 training young tree, 對樹藝知識明顯不足. 直至Pg. 73才提及 structural pruning (Pg. 74 則用 formative pruning), 明顯對樹藝不重視. 用不同詞語亦易引起混淆. Pg. 34 Ecological Value - 同時所帶來的衛生(落在地上腐爛的果實)及管理問題, 隻字未提. Pg. 63 4 Stages of the Tree Life-cycle - 原來由 Qualified Arborist 去 identify. 很想知道從那些文獻有相關研究結果. Pg. 64 "Senescence - At this stage, the tree is in the last stage of its life-cycle with declining vigour and will be most vulnerable to environmental and pathogenic stress." 未找到有關資料來源, 在未有證據支持下, 輕率斷言各品種衰老年期, 令人難以接受. 會為樹木管理帶來不必要的額外負擔. 亦會移除一些無辜老樹. Pg. 69 Pest and Disease Control - 有關衰老期的部份, 資料是2004及2006年, 相比近年樹藝的發展, 年份稍為久遠. -《除害劑條例》是監管除害劑. 漁農自然護理署"Pesticide Registration and Control", 沒有樹木相關章節. - 建築署 General Specification Section 25相應內容(Section 25.25.1)沒有提及處理衰老樹木. - 土木工程拓展署 General Specification for Civil Engineering Works 找不到Section 3.9(僅找到3.09及3.90)均沒有提及衰老樹木senscence. 未知"Refer"那裏, 而這段只是將負面字眼(senescent, vulnerable, decreased resistance) 放在一起. 並未就如何照顧給與指引, 與 Mature, Sapling to semi-matrure 及 Propagation to Seedling相應各段有明顯不同. Pg. 77 "Senescent trees become less effective in compartmentalization, which leads to the spread of infection." 既指出(沒有充足資料支持的)衰老期樹木較難復原, 但同時間建議使用損傷樹木的評估方式 "e.g. resistographs, should be used to determine the amount of decay or other defects in the wood." Speical Maintenance Requirements 是關於播種 "Seed loses viability quickly and should be sown after harvesting". 難道計劃以行道樹作育苗場? Speical Maintenance Requirements 是 "Installation of root barriers or guides is recommended". 然後容易引致環剝根 (girdling root) 及影響結構. 綜合以下特徵"Exotic", "Susceptible to fungal disease", "Tree crown may require annual maintenance" 推薦原因是因為黃花? 還是其他原因? 究竟此指南目的為何? 是要藉以符合BSAP (Biodiversity Strategy and Action Plan)? 莫說品種供應問題, 若以生物多樣性為目的, LA (Landscape Architect) 在設計階段根本不宜選定品種. 由樹藝或園藝專家在了解設計方向後才決定品種. 單由LA決定, 正是一直以來市區植樹/園藝問題的原因. 種植單一品種的問題明顯, 但單一品種所帶來的觀感正正是LA需要作出其專業判斷之處. 例子如太子道的魚木, 大棠的楓香, 大阪御堂筋的銀杏. 專業保護自己的行業理所當然, 但保護主義不等於要包攬所有東西. 把各自專業分工, 發揮各自專長, "做大個餅", 對各專業也會帶來更大效益. hinwan 2019-1-23 18:42 種子 +10 內容充實 Constructive materials ! Ellis 2019-1-21 17:49 種子 +3 讚 Like !! 老土葛 2019-1-4 09:07 種子 +10 內容充實 Constructive materials ! Peter.W 2018-12-30 19:18 種子 +10 內容充實 Constructive materials ! 剎那 2018-12-30 18:23 種子 +10 非常有趣 Hilarious ! The information is under preparation. We will be here soon in Q1 2019.